The Army Organization Act of 1950 became law with President Truman's signature on 28 June 1950. Three days earlier, at dawn on 25 June, North Korean troops crossed the 38th parallel and invaded the Republic of South Korea. President Truman almost immediately ordered troops of the Eighth Army in Japan under General of the Army Douglas MacArthur to support the small and ill-equipped South Korean Army. Thus began a war lasting three years until an armistice was negotiated in July 1953. The Korean War was a test of the effectiveness of the Department of the Army created by the Army Organization Act of 1950. The Army expanded in three years from 600,000 in June 1950 to 1,500,000 in June 1953, while the Army's appropriations tripled during the same period from $6 to $17 billion without requiring a major reorganization. The limited nature of the Korean War was one cause, although the Army was required at the same time to provide troops to support the recently negotiated North Atlantic Treaty Organization (NATO). There was no major reorganization of the Army because it was not necessary to raise, train, and equip a mass army almost from scratch, a major reason for reorganizing the Army in World War I and World War II. groups to help train the armies of anti-Communist governments in Latin America, the Middle East, and Southeast Asia. The principal internal adjustments within the Department of the Army during this period involved the perennial issue of effective control of the Army's supply system, particularly the still autonomous technical services. To solve this problem a series of reorganizations of the Army staff was put through between 1955 and 1956. Two other serious logistical problems were the research and development of new weapons systems and the development of new combat doctrines for their battle�field deployment. The revolution in science and technology and the increasing complexity and costs of new weapons in a period of financial austerity focused attention on these problems. A determined drive by scientists to remove research and development from the control of agencies primarily concerned with procurement and supply led to creation of a new General Staff division, the Office of the Chief of Research and Development, in 1955. The war in Korea, fought mainly with the same weapons and doctrines as World War II, demonstrated a need for development of new weapons and tactical doctrine. Consequently, in 1952 a combat developments program was initiated under the Army Field Forces which, among other things, employed modern scientific operations research techniques developed since World War II. Shortage of funds for the operation of Army installations throughout the continental United States aggravated the continuing dispute between the continental armies and the technical services over responsibility for housekeeping functions at Class II (technical service) installations. This dispute was solved in 1955 by assigning financial responsibility for such functions to the technical services involved. At the same time the Office of the Chief of Army Field Forces was reorganized as the United States Continental Army Command (USCONARC) and, following the pattern of the Army Ground Forces in World War II, placed in command of the continental armies and the Military District of Washington. ber 1952 Secretary of Defense Robert A. Lovett commented on the difficulties he had had in asserting effective control over supply matters because "certain ardent separatists occasionally pop up with the suggestion that the Secretary of Defense play in his own back yard and not trespass on their separately administered preserves." There are seven technical services in the Army . . . . Of these seven technical services, all are in one degree or another in the business of design, procurement, production, supply, distribution, warehousing and issue. Their functions overlap in a number of items, thus adding substantial complication to the difficult problem of administration and control. research and development. They were "virtually self-contained" autonomous commands, each with its own personnel and training systems, no matter what its designation might be as part of the Army staff. He could not identify any consistent functional pattern in their arrangement. They were organized rather on a professional basis with civil engineers, electrical engineers, and mechanical engineers in separate commands. There was fragmentation and duplication of effort in research and development and no effective means of bringing the user, the combat soldier, into the picture. Disagreement among the technical services forced the General Staff, particularly G-4, to intervene in matters for which it lacked both the staff and authority to act. The continental Army commands followed different personnel policies and procedures, forcing G-1 into personnel operations of the Army although it lacked the necessary staff. There was the administrative chaos and friction created by housekeeping functions, especially repairs and utilities, performed for technical service installations by local Army commanders. Here again disagreement forced administrative details "which have no business in the Pentagon" to the top. Quartermaster Corps functions, Army hospitals, finance centers, transportation, maintenance facilities, and surplus disposal facilities. A Procurement Command would combine the procurement and production functions of the Ordnance Department with the construction activities, both military and civilian, of the Corps of Engineers. It would be, like them, organized geographically into regional divisions or districts. Bendetsen thought there might be a continued need for a separate Army headquarters command like the Military District of Washington. Turning to the organization of the General Staff and the Department of the Army, Bendetsen criticized the Pershing tradition of attempting to run the department as if it were a field command. The organization of a field army, he said, was inappropriate for the department because the latter's mission was not to direct military operations but to supply materi�l and trained manpower for such operations. He would relieve the General Staff of all operational responsibilities, leaving five staff divisions: Manpower, Intelligence, Operations, which he would separate from Force Development (Training), and Procurement, Supply, and Services. The technical services would become staff agencies with no field commands or installations under them. At the special staff level he would assign Military History and Troop Information to the Adjutant General's Office. There would be a vice chief and two deputy chiefs, Bendetsen went on, to assist the Chief of Staff, one for Plans and Research who would link long-range strategic planning with research and development and a deputy for Operations and Administration. Like others, he insisted that combining plans and operations in one agency did not make sense. He would also appoint special assistants for political-military affairs and for Reserve Components. was representative of the continuing criticism of the Army's organization and management outside the department. Some of its criticisms and recommendations were also reflected in the reports of various committees that were appointed by or under General Eisenhower when he became President in 1953. President Eisenhower appointed Charles E. Wilson as Secretary of Defense. One of Wilson's first acts was to designate Nelson A. Rockefeller on 19 February 1953 as chairman of an ad hoc committee on the organization of the Department of Defense. It was a blue-ribbon jury, consisting of General of the Army Omar N. Bradley, chairman of the joint Chiefs of Staff, and Dr. Vannevar Bush, both of whom had publicly criticized the national defense organization; Dr. Milton Eisenhower; former Secretary of Defense Robert A. Lovett; Arthur S. Flemming, Director of the Office of Defense Mobilization; and Brig. Gen. David A. Sarnoff, U.S. Army Reserve, of RCA. Other senior military consultants were General of the Army George C. Marshall, Fleet Admiral Chester W. Nimitz, and General Carl Spaatz, U.S. Air Force. The Rockefeller Committee examined the entire spectrum of defense organization and procedures. It sought a Department of Defense so organized and managed that it could "provide the Nation with maximum security at minimum cost and without danger to our free institutions." This required a flexible military establishment "suitable not only for the present period of localized war, but also in time of transition to either full war or relatively secure peace." President Eisenhower accepted many of the recommendations of the Rockefeller Committee in forwarding his Reorganization Plan No. 6 of 1953 to Congress. The new organization strengthened the authority of the chairman of the joint Chiefs of Staff over his colleagues and over the joint staff. Following the Rockefeller Committee's recommendations Reorganization Plan No. 6 abolished the several defense boards, assigning their functions to the Secretary of Defense, and provided him with six new assistant secretaries and a General Counsels.5 Finally it made the service secretaries "executive agents" for carrying out decisions of the JCS. The chain of command now ran from the JCS through service secretaries to the various overseas commands. The three service secretaries, at Secretary Wilson's request, were also studying ways of improving the effectiveness of their own organizations. 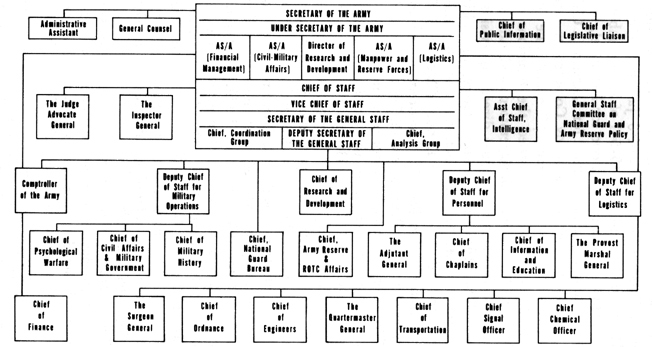 The new Secretary of the Army, Robert T. Stevens, on 18 September 1953 appointed an Advisory Committee on Army Organization which looked like a gathering of Ordnance alumni. The chairman was Paul L. Davies, vice president of the Food Machinery and Chemical Corporation and a director of the American Ordnance Association. Other members were Harold Boeschenstein, president of Owens�Corning Fiberglas; C. Jared Ingersoll, director of the Philadelphia Ordnance District during World War II and president of the Midland Valley Railroad; Irving A. Duffy, a retired Army colonel who was a vice president of the Ford Motor Company; and Lt. Gen. Lyman L. Lemnitzer, Deputy Chief of Staff for Plans and Research. The committee hired McKinsey and Company, a Chicago management consulting firm, as its full-time civilian staff with John J. Corson as its head, and interviewed 129 witnesses over a three-month period, including the heads of every major organizational unit in the Army. The committee submitted its report to Secretary Stevens on 18 December 1953.
an "observer." The Under Secretary would be replaced by a deputy secretary who would act for the Secretary in administering the department. Adding a third assistant secretary would permit each to specialize in one functional area, that is, manpower, materi�l, and financial management. The committee's proposal for a training command was a return to the wartime concept of Army Ground Forces. The Continental Army Command, operating under the supervision of G-3, would be responsible for all "combat arms" training in the Army, individual as well as unit, basic and combined, Regular and Reserve. A Supply Command was necessary for the effective control over the technical services. Under the existing organization G-4, although responsible for directing and controlling the activities of the technical services, shared authority over them with other staff divisions, principally the Army Comptroller and G-1. A Supply Command would have greater control over the technical services in these areas and over training, while G-4 would remain responsible for logistical planning and policies. Davies Committee proposed to strengthen the existing authority of the Chief of Research and Development in the Office of the Deputy Chief of Staff for Plans and Research by transferring to his office the planning functions in this area then assigned to G-4. Research and development operating responsibilities it would transfer to the Supply Command. The existing organization of the Army staff, it admitted, diffused responsibility for research and development, and it acknowledged that many people felt that research, essentially a planning function, had been subordinated to current production and procurement operations. The committee, on the other hand, believed a separate research and development division on the General Staff or the creation of a separate "Development" Command would cause more difficulties than it would overcome. It did not believe that a special staff division would improve the co-ordination and management of research and development in the Army. A separate "functional" command would "separate research and development from closely related procurement and distribution activities." The Army would then have to find a new means of integrating these "essentially integral activities." Removing "development" from the influence of those concerned with production and procurement would "insulate" research personnel from the views of the user of weapons and other materi�l. This, too, was the view of the Ordnance Department. Like earlier civilian reorganization proposals the Davies Committee report insisted the Army staff should get out of operations, while military officers like those on the Patch�Simpson Board had asserted that this simply could not be done. The proposal that met the strongest opposition within the Army; creating a Supply Command, involved this principle. The basic military argument against it was simply that it was impossible to divorce the General Staff from its responsibility for supply operations. The Army staff's reaction was to turn the Davies proposal upside down. 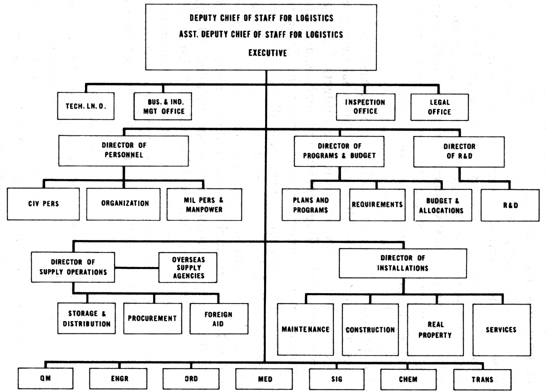 Instead of a Supply Command the Army staff proposed making the G-4 a Deputy Chief of Staff for Logistics with greater "command" over the technical services. In briefing the new Chief of Staff, General Matthew B. Ridgway, on 19 August 1953 General Palmer resorted to the Constitutional doctrine of "implied powers," quoting Chief Justice John Marshall's decision in McCulloch versus Maryland to support his point. His authority under Special Regulation 10-15-1 included not only logistic staff functions but also direction and control of the technical staffs and services. "All the responsibility is given me, and all powers necessary to discharge the responsibilities must be inferred as granted. While the Davies Committee deliberated, there were rumors within the Army staff that creating a Supply Command would be one of its major recommendations. A General Staff committee requested the G-4's formal position on the Army's "Logistic Structure at the Departmental Level." Speaking for General Palmer, Maj. Gen. Carter B. Magruder, his deputy, said that G-4's existing authority, based on applying the theory of implied powers, was adequate for managing the Army's supply system. "Creation of a Logistics Command," he said, "would require a large headquarters and would interpose a ponderous additional step in doing business, with no obvious improvement in management." The experience of both world wars demonstrated that the supply organization finally evolved combined both logistical staff planning with command over the supply services. General Somervell himself, General Magruder asserted, "favored an ASF commander who would also be the Chief of Staff's advisor on logistics." The organization of the technical services themselves was "fundamentally sound." Simple directives could reassign functions among them whenever necessary. What they needed was "vigorous direction, control, and coordination by a single authority." If an integrated Army logistics system is to be achieved, the appointment of a Deputy Chief of Staff for Logistics is a vital first step. The Deputy Chief of Staff for Logistics must be given full authority for the provision, administration, and control of military personnel, civilian personnel, and funds for, and the direction and control of, the seven Technical Services. He "should have a command relationship to the Technical Services" and exercise staff supervision over "wholesale-level logistics activities overseas." Source: Secretary of the Army's (the Slezak) Plan, 14 June 1954. Mr. Slezak, in a memorandum for General Ridgway on 8 September 1954 approving the detailed reorganization plan, called his attention principally to the Charter for the new Deputy Chief of Staff for Logistics. a. The purpose is to combine the seven technical services into an integrated logistical system, subordinating the Chiefs of Technical Services to the head of this system and giving him authority to modify the respective Technical Service missions in order to achieve one integrated system in place of seven autonomies. b. Accordingly, it is intended that wherever the authority granted the Deputy Chief of Staff for Logistics involves transfer to him of authority heretofore exercised by other parts of the Army staff, the extent of the transfer shall be interpreted so as to insure that the Deputy Chief of Staff for Logistics can carry out the objectives set forth in paragraph a. above. and personnel which are essential to the discharge of this responsibility." 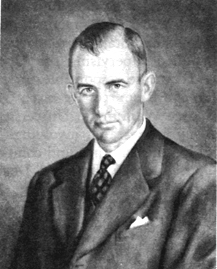 He would be responsible for the development of logistics doctrine and manuals, for supervising logistics training and education where more than a single technical service was involved, for logistics planning, for development of logistics programs and budgets, for development and supervision of financial management, including stock and industrial funds within the technical services, and for development of the Army's logistics requirements. Acting on the basis of this authority he was to prescribe the missions, organization, and procedures of the technical services, to supervise their training, develop and supervise "a single, integrated career system" for technical service personnel, to exercise manpower controls over both their civilian and military personnel, to administer their civilian personnel programs, including industrial and labor relations, and to supervise all aspects of financial management within the technical services, including budgets, funding, allocation of personnel ceilings, review and analysis, and statistical reporting controls under the authority of the Comptroller of the Army. The Surgeon General was allowed direct access to the Secretary and the Chief of Staff on matters involving the health and medical care of troops and utilization of medically trained military personnel. Responsibility for the civil functions of the Chief of Engineers was not included. Change 6 also removed from the Deputy Chief of Staff for Logistics responsibility for directing the research and development activities of the technical services. The organization of the Office of the Deputy Chief of Staff for Logistics to carry out these new duties is outlined in Chart 21. 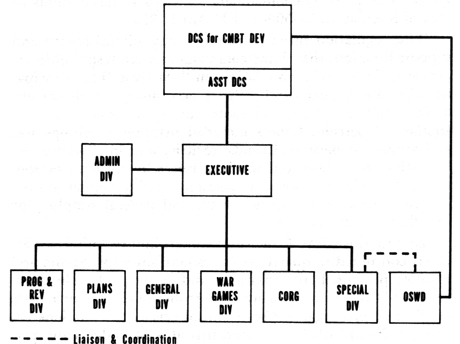 Source SR 10-5-1 Change 4,8 Sep 54, and Internal Deplog Organization Chart of 9 Sep 54.
matter how that term was defined, but a General Staff officer acting for the Secretary of the Army. 1 Not an Official Organization Chart. 2 For Practical Purposes Those Agencies Listed as Technically Subordinate to DCSOPS, DCSPER, and DCSLOG, Actually Reported Direct to the Chief of Staff. Source: DA, DO No 70, 27 Dec 1955. CSR 10-1, 3 Jan 56. Co-ordinating the Army's program system was the responsibility of the new Programs and Analysis Group. This meant the proper balancing of Army programs with resources in men, materi�l, and money. The planning, execution, and review and analysis of the Army's programs at the Army staff level were now under one small agency in the Chief of Staff's Office. Under the new dispensation the Management Office within the secretariat became, in effect, the Comptroller of the Army staff but the relationship between this agency and the Office of the Comptroller of the Army was not clear. In theory the Management Office's responsibilities for management functions within the Army staff included the Comptroller's Office, while the Comptroller of the Army was responsible for such functions throughout the Army. Theoretically the Comptroller's Office would review the Army staff's budget and manpower ceilings, including those of its own headquarters, prepared by the Management Office. In practice, the Comptroller had been reduced to the level of a Deputy Chief of Staff coequal with but not superior to his colleagues as he had been before 1956. No major change took place in the organization of the Army staff or the Chief of Staff's Office from 1956 until John F.
Under the Eisenhower reorganization of 1946 recognition of research and development within the Army as an activity separate from logistics seemed assured with the creation of a separate Directorate for Research and Development. The War Department Equipment Board, known as the Stilwell Board, in its report of 29 May 1946 reiterated General Eisenhower's statement of Army policy on research and development. Scientific research is a paramount factor in National Defense. It is mandatory that some procedure be adopted whereby scientific research is accorded a major role in the post war development of military equipment. The scientific talent available within the military establishment is not adequate for this task and must be augmented . . . . In general the scientific laboratories of the Technical Services should be devoted to those problems so peculiarly military as to have no counterpart among civilian research facilities, meanwhile utilizing, on a contract basis the civilian educational institutions and industrial laboratories for the solution of problems within their scope. officers from each technical service, a nationally known scientist as senior assistant to the director, and an outstanding scientist in each major field of science assigned on rotation from the major scientific colleges and industrial laboratories. General officers from the field commands and officers from each arm and service should represent the using arms in the development of new or improved weapons. The mission of the Directorate of Research and Development was to supervise all Army research activities and to co�ordinate the research and development activities of the arms and services. It would establish priorities, make certain that the technical services and arms maintained contact with civilian research programs, supervise and review the Army's long-range research and development program, confirm the need for new and improved equipment, and advise the Budget Division on the funds required for its work. important to retain the link between research and procurement. Besides, the technical services ought to report through only one direct command channel. 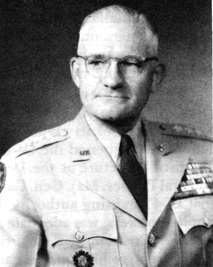 In the fall of 1951 Maj. Gen. Maxwell D. Taylor, then Deputy Chief of Staff for Organization and Training, sought to reopen the question of a separate Research and Development Division because "its increased importance and extended scope make increasingly, apparent the lack of logic in assigning Research and Development to G-4." Secretary Pace agreed that "the departmental research and development functions must be removed from G-4." By this time opinion within the General Staff had shifted. Most favored a separate General Staff division in some form, but the G-2 and G-3 suggested placing this function under the Deputy Chief of Staff for Plans. General Larkin and General Collins still opposed a separate staff agency. President Eisenhower's Reorganization Plan No. 6 of 1953 reopened the question of the relationship of research and development to logistics within the Army. The new Defense Department organization had strengthened control over research and development by replacing the unwieldy Research and Development Board with two assistant secretaries, one for Research and Development and another for Applications Engineering, both separate from the Assistant Secretary for Supply and Logistics. The Davies Committee on Army organization considered separation of research from supply in its own deliberations. The new organization was not satisfactory because both the Assistant Secretary for Logistics and Research and Development and the Deputy Chief of Staff for Plans and Research were overburdened with work. The McKinsey and Company report of March 1955 said that the Army should create a new Research and Development Directorate, relieving the existing Assistant Secretary for Logistics of this burden. The Second Hoover Commission of 1955 recommended assigning to the Assistant Secretary for Logistics responsibility for almost all Army logistical functions, including research and development and supervision of the technical services, removing these functions entirely from the General Staff. The Chief of Research and Development had little or no say in the placement of personnel . . . in responsible research and development positions within the Technical Services. And even if he were consulted there was no means by which he might reward outstanding effort or penalize unsatisfactory performance. over funds, personnel, and facilities to accomplish his mission." 67 The full ASAP urged that the Chief of Research and Development have sole responsibility for all policy decisions in his area and sole control of funds required to carry out his missions, including the construction, evaluation, and testing of prototypes. During this same period the ASAP conducted a series of studies and held conferences aimed at reducing the lead time between the point when a new weapon is conceived and the time it reaches the soldier on the battlefield. The ASAP believed that much time was wasted simply in unproductive red tape and that more authority for the Chief of Research and Development would reduce it. A year later, on 23 March 1960, Mr. Morse once more submitted his own proposal for a separate research and development command. His chief targets were the technical services which did not, he believed, enjoy "an unqualified reputation in the scientific community." The Army would have a satisfactory research and development program only if it were to increase its prestige and "overcome tradition." The command, he proposed, would serve under a Chief of Research and Development with full Deputy Chief of Staff status and an Assistant Secretary for Research and Development. In summary, after World War II the Army's research and development program went through three distinct phases. Before the Korean War declining appropriations and the department's constant preoccupation with current daily crises led to the disappearance of "Research and Development" as a major effort. The Korean War renewed interest in the subject, and a struggle began between scientists, who wished a separate General Staff division, and elements of the Army staff, who insisted on its continued subordination to logistics. Between 1955 and 1961, as Chiefs of Research and Development, General Gavin and General Trudeau fought to remove controls from the Office of the Deputy Chief of Staff for Logistics over the men, money, and materi�l required for their programs. Except for the civilian scientists, the Army staff continued to oppose creating an independent research and development command because it involved the independence and integrity of the technical services. techniques on tactics and doctrine, formulating new doctrines and procedures for their employment, and supervising the various boards and agencies which tested them. In the development of materi�l Army Field Forces responsibilities were limited to determining military requirements for new weapons and equipment normally used by field armies. The technical services remained responsible for materi�l not normally used in field armies. This regulation indicated the complex organizational relationships that were involved in combat developments. Co�ordinating the efforts of Army Field Forces with those of individual Army staff agencies, with the technical services, and with the Air Force and Navy in joint projects involved an enormous amount of administrative delay. Within Army Field Forces one of the earliest problems arose out of the difficulties the Combat Developments Division within G-3 experienced in developing long-range programs. Understandably, it had become too involved in current operations. The solution was to form a special study group of military officers, who were to work closely with the Johns Hopkins University civilian analysts as a combat operations research group, known as CORG. CONARC's organization indicating the status of its combat and materi�l development agencies in January 1959 is outlined on Chart 23. After ten years the Army's program for combat developments was still a loose-jointed arrangement among CONARC, the General Staff (where three agencies were involved), and the technical and administrative services. Co�ordination and concurrences required to reach decisions on new weapons and equipment among so many agencies still required an enormous amount of time. This was equally true of the Army's research and development programs and symptomatic of the lack of effective executive control in these areas. Source: Organization & Functions Manual, Hq, USCONARC, 1 January 1959.
keeping functions performed by the continental armies for the technical service Class II installations within their jurisdiction. A third change involved resurrecting the principle of Army Ground Forces as a field command with command authority over the continental armies. The housekeeping functions performed after World War II by continental Army commanders as landlords for their tenants, the Class II technical service installations, became a chronic source of irritation for the Army commanders who had to perform them, the technical services chiefs who complained service was inadequate, and the Army staff which had to referee the disputes that constantly arose. proposals. The Army staff considered the test a failure and attempted only to define more precisely the housekeeping responsibility of Army commanders for Class II installations in Special Regulation 10-500-1 of 11 April 1950. Army commanders and their technical service tenants because failure to perform these functions directly interfered with the latter's primary functions. Without them they could not operate. These functions included changes to and maintenance of real property, permanently installed equipment, utility services, plants and systems, fire protection, packing and crating, and insect and rodent control. Ordnance Department and Chemical Warfare Service industrial plants and arsenals which built and operated their own utilities were exempted. It was difficult to determine what was properly repairs and utilities and what was the responsibility of the technical services. Maintaining and repairing production machinery and equipment, a responsibility of the technical services, was "dependent upon" maintenance functions paid for by R&U funds. Often there were separate repair shops set up for each category. Planning and budgeting through two separate command channels created frequent delays, particularly when there was disagreement over priorities. The technical services resorted to diverting funds from their primary missions when they could not obtain sufficient funds from Army commanders. The First Army survey pointed out that had the technical services not diverted these funds the operations of their installations might have broken down or at least been seriously impaired. At one Quartermaster depot in upstate New York there were no R&U funds for snow removal. Prompt shipments in and out of the depot were considered vital for national defense; therefore Quartermaster funds were diverted to meet the immediate emergency. The Ordnance Corps often used emergency "expediting-production" funds for R&U projects. In defense of the Army commanders, the First Army survey said that they were often not informed sufficiently in advance of Class II requirements for R&U projects, a weakness it attributed directly to the system of dual command. The Davies Committee studied the First Army survey and recommended that responsibility for funds and personnel required to support Class II installations be assigned to the technical services. The Slezak report agreed and decided that this time unity of command, the basic concept that "a Commander must have control of the resources required for the accomplishment of his mission," should be decided in favor of the technical services instead of the Army commanders. As a result, under Army Regulation 10-50 of 25 March 1955 Army commanders were relieved generally of responsibility for providing funds, personnel, and other resources for principal Class II mission and support activities. They retained responsibility only for common support functions incidental to these primary missions: chaplains, military justice and provost marshal services, counterintelligence, medical and dental services, public information and troop education programs, and general inspection and review. Thus ended a decade of constant irritation and friction between the continental armies and the technical services. The Davies Committee's major criticism of the continental armies was that the Army's organizational framework for military operations and training was diffuse and confusing. The commanders of all the continental armies and the Military District of Washington reported directly to the Chief of Staff, and the General Staff was too involved in minor administrative decisions concerning the continental armies that ought to be made at a lower level. Under Army Regulation 10-7 of 4 April 1957 the Army group concept of CONARC was replaced by that of an overseas theater command with full control over the resources needed to direct the operations of the ZI armies as McKinsey and Company had recommended. CONARC's new responsibilities included manpower controls over both civilian and military personnel and the planning, direction, and control of nearly all major administrative and logistical support activities within the ZI armies. Under the Army's revised "Program System," as outlined in Army Regulation 11-1 of 31 December 1956, CONARC was made responsible, beginning in fiscal year 1959, for development, execution, and review and analysis of the new installations, mat6riel, reserve components, and research and development programs. Its new financial management responsibilities included the direction of progress and statistical reporting and the provision of "management engineering" assistance. It was also assigned responsibility for intelligence activities within the continental armies and for the management and direction of Army aviation training except for units under the command of the Chief of Transportation. The organizational changes discussed in this chapter were internal ones within the Department of the Army and the continental armies. 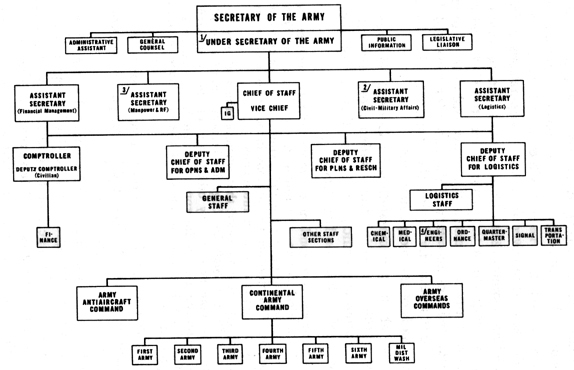 The Palmer reorganizations of the Army staff represented a swing of the pendulum away from the effort made in 1950 to centralize control over the department and the Army under the three-deputy system. General Palmer sought instead to centralize control at the next lower level under the several General Staff divisions, vesting them with greater authority over the technical services and special staff agencies. Despite General Palmer's efforts, control over Army logistics and the technical services remained necessarily fragmented among the General Staff divisions. The addition of the Office of the Chief of Research and Development, created as the result of pressure from the scientific community both within and outside the Army, complicated the problem further. The establishment of CONARC as a unified field command represented a return to the wartime concept of Army Ground Forces. In this change the fragmented control over the continental armies among the General Staff divisions was abandoned for centralized control in a single command. At the same time the divided authority exercised by the continental Army commanders and the chiefs of the technical services over housekeeping functions performed at technical service installations, a constant headache for all concerned after World War II, was abolished. The technical services were made responsible for the bulk of their own housekeeping functions. gram was still in its infancy at the end of the decade, plagued by the same fragmented control over its operations that bedeviled Army logistics generally. These internal changes within the Department of the Army took place within the framework of organizational changes at the Department of Defense level that not only influenced Army structure but also changed the position of the Department of the Army within the Department of Defense. Particularly important were changes in the fields of financial management, common supply activities, and control over military operations.